Home » COMPARISONS » Makita Vs Milwaukee Cordless Drill – Which of them is better? Power tools are an important part of not only every workshop but also every home and no home is complete without a great power drill. So, when selecting the best power drill that you want to last for the life of your home, there are only two brands you should trust – Milwaukee and Makita. But which brand is the best? That’s what we’re going to tackle today together to determine why you should purchase one over the other. Where did these brands come from? The Milwaukee brand is from none other than Milwaukee, Wisconsin, in the US and was founded by A.H. Peterson. Peterson was challenged by Henry Ford (founder of Ford) to come up with a power drill for one of his projects which were small and easy to use. That is what lead them on the path to making the Milwaukee brand of power tools. The Makita brand, on the other hand, is based in Japan but operates around the world. Their company has always focused big on developing motors designed for each unique tight space. It wasn’t until 1969 when they introduced one of the first cordless battery powered drills. Not only was it one of the first battery powered, but also one of the very first rechargeable battery powered tools on the market. While there are many different models under each company, for the sake of a comparison chart, I will review two of the most relevant and top of the line models from each including the Milwaukee 2753 and the Makita XDT09. This guide does not just focus on those two devices but rather the drill products from each company as a whole. We’re going to break down each of these brands and give you a deep dive into what their features are in terms of the great offerings they have. This includes both battery life, rotations per minute, torque, and settings. Then we will go through also some of their shortcomings in terms of where they need improvement over the competition. The Milwaukee Powerstate Motor is extremely efficient and can deliver up to 1,800 lbs of torque which makes the work of drilling through any material simple and easy. 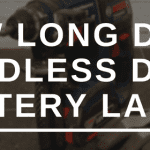 Their cordless drills can go through concrete, bricks, metal and heavy wood with little to no effort. No matter what job you need to do, you won’t have to switch between large and small drills. The motor has a 4-mode drive control which makes it easy to switch between different tasks easy no matter what the material you’re drilling into is. If you need a slower or faster RPM simply switch between modes 1, 2, or 3. Mode 1 is from 0-850 RPM, mode 2 goes 0-2100 RPM, and mode 3 goes from 0-3000 RPM. This is great especially so you can use the proper mode per surface. Mode 4 is a new functionality to some drills and this is what we call the “auto-mode” which basically means the drill will automatically speed up and ramp down depending on where it is in the drilling process. This mode is great for beginners. Milwaukee drills come mostly with a 5mAh battery, but you can also get the compact 1.5 mAh battery. The 5mAh battery will last you typically for several days of working without needing to be recharged although it is recommended to recharge after you’ve used it for the day. The Milwaukee drills are made for big projects which will require a lot of work drilling very long screws. Using a cheaper, smaller drill will usually take a whole lot longer and over a couple hours will eventually cause your hand or wrists to become quite sore. Typically, Milwaukee drills are used for installing plywood floors, wooden decks, and pushing screws into other dense materials. The Makita company isn’t new, and while Milwaukee typically gets most of the spotlight, Makita has been around for 100 years now and have built a highly comparable drill. The newest of their line can push up to 1550 lbs of torque which is impressive and highly desired for those looking to drill through thick substances including heavy wood, concrete, and others. This is due to the Brushless Motor which ensures high performance and a longer run time which is what keeps the Makita fly ahead of their competitors. The XDT09 is the newest one and there are raving reviews that with the increase in efficiency and performance, the weight did not increase. It is still a very lightweight drill. Each Makita drill comes perfectly built with rubber grips in the right places and are ergonomic to hold in one hand. Like the Milwaukee brand, the Makita also has 4 modes that you can select through which include soft, medium, and hard to be cycled through depending on the need and surface you’re drilling into. The 4th mode is called QuickShift which is used when you want the drill to automatically speed up and then speed down as you near the end of the drill. Both the drill and battery both come with 3-year warranties so that if something goes wrong, you’ll have the support you need. It also is built to be both dust and water resistant, however, with the electrical parts on the drill rotating so fast you want to be sure to keep both dust and water away from the device. While everything about this drill screams perfection, it does come with a pretty hefty price tag. The drill alone costs over $100 but you typically should buy a kit as the drill does not come with the batteries and charger. You would also highly benefit from the different drill bits and attachments that come with the kit. Additionally, the battery can take a while to re-charge although they do have faster-charging batteries which have to be purchased separately. While the Makita has the same mAh battery as the Milwaukee brand does, we often find the Makita needing to recharge at the end of every day. This can often be a challenge if you’re on the job and you don’t have time to re-charge. The battery does re-charge within 30 minutes, so this can be negated with a simple quick-charge. While the Makita and Milwaukee both have very great brands and high-power/performance equipment, it’s without a doubt that the Milwaukee brand gets the award for the best cordless power drill. The primary factor in deciding this all comes down to the battery life. When put side-by-side, the Makita and Milwaukee drills both can perform the same tasks at the same level of ease and speed. The Makita, however, starts to drag down over time and needs a recharge, whereas the Milwaukee will outlast even the largest projects in a given day. Whatever the Milwaukee team is doing with their batteries, it definitely is doing the job right as the last days on the job. The only reason we see that you would purchase the Makita over the Milwaukee is only the price tag. If the price is a bit higher than you wanted, you may go for the Makita instead. If you are looking to accomplish simple DIY tasks at home, go with the Makita. If you’re looking to complete large projects like building a house, shed, or other big things, you definitely should go with the Milwaukee. Always ensure you clean the contact points on the battery pack to ensure it charges right and to full. This will extend the life of the battery and ensure you start with a full-charge. Use an air gun to remove the dust from the vents to ensure it can ventilate and not overheat causing damage internally to the drill. Every couple of years, depending on how much use it gets, it should be taken into a service facility for cleaning, inspection, and lubrication to ensure the drill will last for many years. Often with proper maintenance, either of these drill brands will often even outlast how long you need it. Best Corded Drills For Woodworking - Top 3 picks!